Want to improve your SEO? Don’t ignore “branded” search. At ArcStone, our most comprehensive marketing campaigns involve SEO. It may not instantly drive traffic and conversions like paid search does, but long term, SEO delivers results at a fraction of the cost. Unlike paid ads, the results can build on itself over time. However, even if clients understand the importance of SEO, many focus on keyword strategy. We can all tend to forget the power of branded campaigns. Below I'll remind you of why brand SEO is so vital to improve your overall digital strategy. While achieving good search positions for these types of non-branded keywords is important to grow your organic traffic, I’d argue that it’s critical that you don’t overlook brand SEO opportunities. As you see above, branded keywords can also include acronyms too. If you’re a nonprofit, your audience may refer to you as your shortened acronym AND your full name. Website traffic that comes to your website from a branded search term tends to be more qualified than traffic from other keywords. In other words, branded traffic is further along in the funnel and closer to taking action. It’s rare that a person converts the first time they visit your website. It’s more likely they first found you through a paid campaign, then returned to your site for more information. This second visit would be from the user searching for your brand in Google and thus, landing on your site organically. Branded campaigns are extremely helpful for building awareness to your brand. Each time your brand shows up near the top results, your name is reaching new audiences. Just be sure you manage the content that Google or Bing shows in the search results as this is the first thing searchers will see. Branded campaigns can help manage the content that Google or Bing shows in the search results. We once had a client come to us with a really bad review that was coming up first when a user searched their company name. By optimizing their site for branded search terms, we were able to control the content in the top search results and reduce the effects of this one negative review. Branded campaigns and SEO efforts don’t produce immediate results like a paid campaign does, but with a solid strategy and consistent efforts, it can boost your conversions for the long haul. 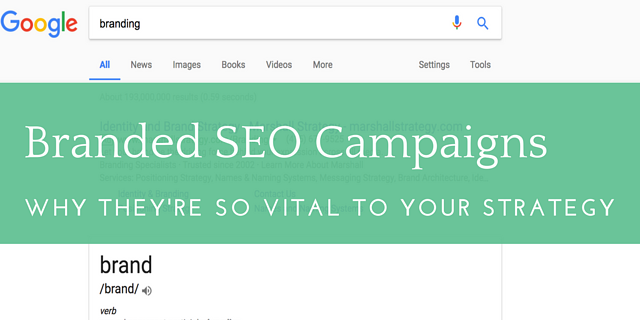 If you’re considering SEO, running a branded campaign is a great place to start.